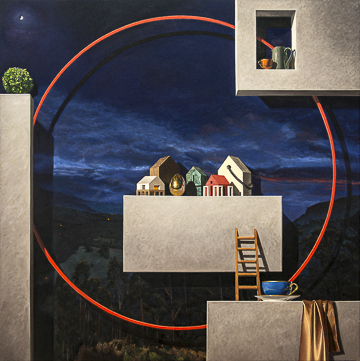 The artist combines and layers a number of visual and conceptual elements to create the notion of worlds within worlds. Carefully planned and executed, these paintings reflect his interest in perfection, but also explore his fascination for the dream-like nature of reality. This subversion of fictional reality that unifies and separates at the same time, is what Waters refers to as his 'magic realism'. Illuminate continues until the 22nd October 2016.